The Daytona InKart Championships is the perfect way for drivers to compete in a championship series without the expense of owning and running their own karts. 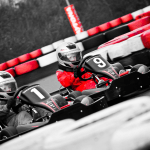 Daytona Milton Keynes’ InKart Championships offer a competitive race series throughout the year for drivers who want to race in evenly matched racing karts without any of the hassle or expense of owning and prepping their own karts. With the Junior and Cadet Championships open to Daytona Race School Graduates aged 8-13 years and the Senior Championships open to anyone aged 14 and over, the InKart Champs are a popular way to experience a racing series. 2019 will see some exciting changes to the InKart Championships, with a Spring Championship contested over 11 rounds (9 to count) from January to June and a 9 round (8 to count) Autumn Championship running from September to December. A brand new format for 2019 sees 18 Cadets and 16 Juniors participating at each round, with 10 minutes of Practice/Qualifying followed by a 20 minute feature race. Once drivers are signed in, 50% of the Cadet drivers and 50% of the Junior drivers will be randomly assigned to one of two 10-minute Practice/Qualifying sessions. After qualifying is completed, the slower half of each grid (Cadets / Juniors) will contest the 20-minute B-Final with the faster half in the A-Final. Both Cadet and Junior karts will be on circuit together, with staggered starts. There will be no Division structure in 2019. The arrival time for every round will be 0845hrs with an optional Championship Test session beforehand. Championship Racing returns after the Summer break meaning no more worrying about when you can holiday! As with the Spring Championship, if you book for the full Autumn Championship in advance, you save ££s! If you’d like to race in the 2019 National InKart Championship, you need InKart Membership. Members benefit from a 10% discount on Cadet/Junior Sprint Races and Junior Arrive&Drive. Members may also enter InKart rounds at our other outdoor venues; Daytona Sandown Park and Daytona Tamworth. Membership for the season costs £35 inc VAT. The 2019 International InKart Championship will be contested over ten rounds, from January to November, with a driver’s best 8 scores counting towards the final Championship Standings. As the SODI RT8 Championship continues to go from strength to strength, we will continue in 2019 with the same heats format, and the 4 exciting variations of the International Circuit. Any driver aged 14 or above will be eligible to enter into the SODI RT8 InKart Championship. After an initial 5 minutes of untimed practice, all drivers (both Lights and Heavies) will leave the Pit Lane at 5 second intervals for the Super Pole qualifying session. Drivers will have one out-lap, followed by one flying lap. The lap-time set on their flying lap will determine their grid position for the first race. Upon completion of a drivers flying lap, they will return to the Pit Lane. All drivers will compete in two 10 minute points scoring heats; the grid for the first race will be determined by the laps set in the Super Pole Qualifying session, and the grid for the second race will be a reversal of the Super Pole session. The points scored in the two heats will determine the grid for a 15 minute Grand Final. For the first time, drivers will be able to take part in a competitive Championship in our high performance 2-stroke DMAX karts at Daytona Milton Keynes. Running on the same day as the SODI RT8 Championship, drivers will take part in 10 minutes of qualifying followed by a non-stop 40 minute race to the chequered flag. There will be two classes within each round with drivers 85kgs and above classified in the Heavy Championship and those under 85kgs classified in the Lights Championship. Light drivers will be required to weight up to 65kgs – Daytona will be able to supply limited ballast but anyone requiring significant ballast (more than 10kgs) should make arrangements to provide their own. Experienced drivers aged 14 or above will be eligible to enter into the DMAX InKart Championship. Drivers aged 14 or 15 must pass an assessment in order to participate. Please call Mark on 033 033 27870, extension 321 for more information or to book your space in the next round of the Daytona Milton Keynes InKart Championship.